Into last night’s slight drizzle, we all went trick-or-treating. I wore my usual costume, which is to say the costume I wear every cool autumn day—jeans, t-shirt, and a beat-up black sport coat. Heather dressed up as a character from a steampunk novel, wearing a black top hat equipped with high powered goggles and a long overcoat; Maggie put on a curly black wig, a glittery jump suit, and painted various scars on her arm and face so as to become a disco zombie; and Julien had an apron that covered him on the front and back and that turned him into Thomas the Train. Julien, though, wasn’t really getting into it, and got rather frightened by some of the costumes he saw. So, after walking up to the end of our block—to the house whose occupants look like they stepped out of one of Larry Clark’s old books documenting his drug addicted friends—Julien and I headed back home and let Maggie and Heather go on ahead. On their way back, they picked up something for dinner. By the time we were done, it was already late and time to get ready for bed. Part of Maggie’s routine involves each of us sitting with her in her bedroom before she falls asleep. Heather always sits with her first before taking Julien to bed, then—usually around half an hour after Heather and Julien have gone to bed—Maggie calls me from the top of the stairs and asks me to come up. By that time I’m usually at the computer working, which means it’s time for a break. Last night when I went up Maggie wanted me to tell her a story. This time she gave me three things to include in the story I was to make up on the spot: a rainbow, the city, and Adam Sandler’s movie Bedtime Stories. The rainbow thought and thought about it, then came up with an idea. “I bet the answer is in the Adam Sandler movie Bedtime Stories. If I watch this movie carefully, I’ll discover the secret to ending the rain that keeps falling whenever I appear in the sky.” The rainbow then watched Bedtime Stories in its DVD player. It watched the movie carefully, several times, but after having done so it still had no solution as to how to stop the rain. Then another idea occurred to the rainbow, “Maybe if I watch it backwards, that’s how I’ll find the answer in the movie.” The rainbow figured out a way to make the entire movie play backwards in its DVD player with the sound on and watched and listened. Somehow, when the rainbow heard Adam Sandler’s voice going backwards, what it heard wasn’t just garbled, nonsensical sound, but real words—words the actor Adam Sandler had no idea he was saying. It was in these words that the rainbow found the secret to stopping the rain, and the next day when it appeared in the sky over the city, the heavy rain turned into a drizzle, then into a mist, and then, finally, it was all gone. And the rainbow stretched its colors from one end of the city to the other as the people welcomed it and praised it, saying it was the best of all the rainbows. The End. Maggie liked the story, but she wanted more. I told her I was too tired—that I didn’t have another story in me for the night. She then let me finish story time by reading Bob Hicok’s poem “My New Neighbor” in which Bob Hicok talks to one of the cows that grazes in a field next to a Presbyterian church in his neighborhood. By the end of the poem, Maggie had closed her eyes. She wasn’t quite asleep, but she was almost there. I sat there quietly for a few more minutes before I went back downstairs. I tried to finish the story I was writing, but I was too tired to continue. So, after a little while, I went to sleep, too. 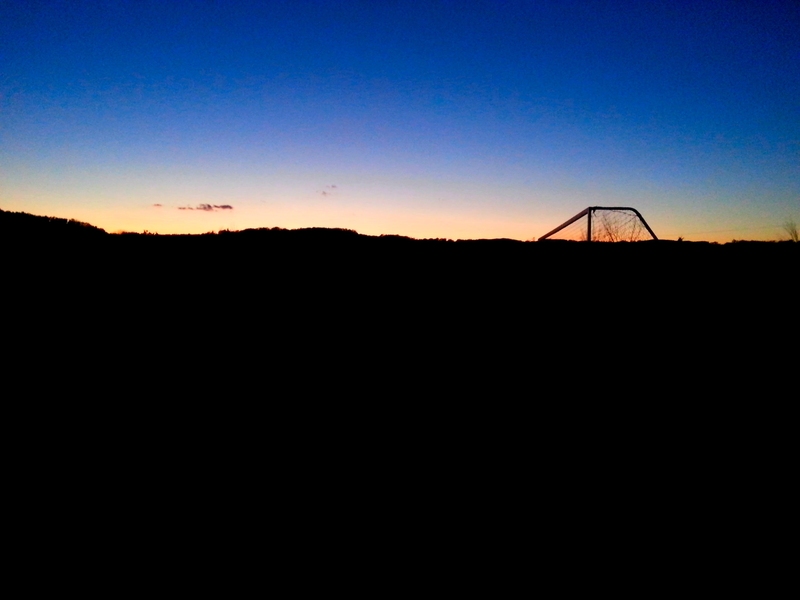 This photograph of the soccer field was taken around 6:30 this evening, toward the end of Maggie’s soccer practice. As it got darker and darker tonight, the landscape of the soccer field against the mountains and the November sky looked more and more like a painting by Mark Rothko. I didn’t want to think about Mark Rothko. Mark Rothko, as good as he was, always made me think about the endings of things and I wasn’t in the mood to think about the ending of things. Maggie and her teammates practiced until it was too dark to continue, cutting their practice hour short by about fifteen minutes. 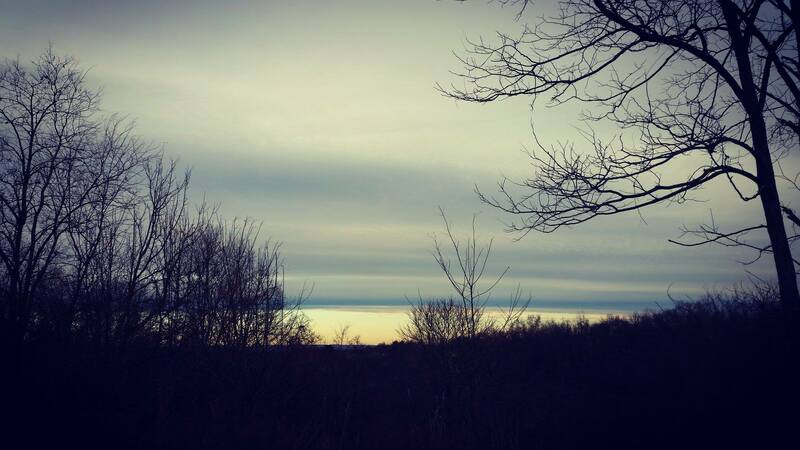 As we headed home, and the evening’s last colors faded into the darkness, the landscape of our small town seemed to slowly change. When Maggie and I walked in the door, dinner was ready. Heather, Maggie, Julien, and I ate under the pale yellow dining room light, and as I started to feel full, the sound of our forks against our plates began to sound more and more like music.